A video in support of breast cancer awareness has helped fund the refurbishment of a school fitness suite. Under the banner of ‘Saltus Knight Media Company’, students in the Media Department at Saltus Grammar School developed an ad campaign – which included the video – designed to get more students involved island-wide in the annual BF&M Bermuda Cancer and Health Centre Breast Cancer Walk. They created promotional materials including the video and even designed two trophies: one for the school team with the most participants and the other for the school team which raised the most funds. The group included students from S9, S11 and SGY1. It was done as part of PartnerRe’s Dollars for Hours scheme, which matches a charity’s needs with a work group from a school, and meant they received a donation of $30,000 from the reinsurance firm. 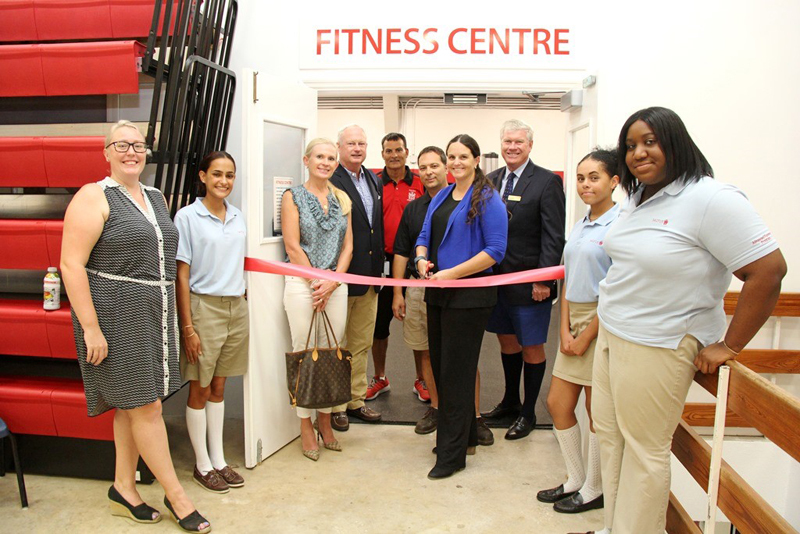 In addition, Lindo’s Market and Lindo’s Family Foods and some Saltus families – Diana Andrew and sons Christopher and Jonathan Andrew; along with Duncan and Jennifer Card and their sons Beau and JD Card – also made donations which enabled the school to complete the Fitness Suite at the Haygarth gym. Director of Athletics Darrin Lewis said: “Director of Athletics Darrin Lewis said: “We cannot thank our own students enough for the amazing ad campaign developed by the students to increase student participation in connection with a good cause and which also helped to raise money for the gym. “We are also indebted to PartnerRe, Lindo’s, Diana Andrew and Duncan and Jennifer Card for their outstanding generosity.